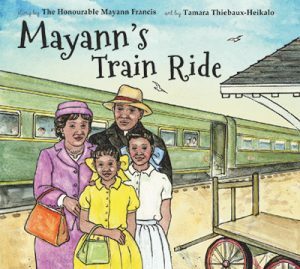 Mayann’s Train Ride is a memory of The Honourable Mayann Francis, the 31st lieutenant-governor of Nova Scotia who is the first African Nova Scotian to hold this position. The author tells a story about when she travelled with her sister, mother and father from Whitney Pier, Nova Scotia to New York to visit her extended family. Mayann is so proud of the fact that she is able to travel with her new green purse making her feel just like her mother. The purse holds her travel journal and an American five-dollar bill her uncle gave her. After the family’s visit to the Bronx Zoo, Mayann realizes that she has left her beloved purse on the subway. Her loss takes the enjoyment out of the rest of her trip. A visit to a church in Harlem brings a welcome surprise for Mayann when she receives gifts from a family friend: a black doll—the first black doll she had ever seen—and a new green purse with a notebook and another five-dollar bill. Mayann realizes that people are more important than possessions. Classroom Connections: This book lends itself to rich discussions about the lesson Mayann learned from her experience. 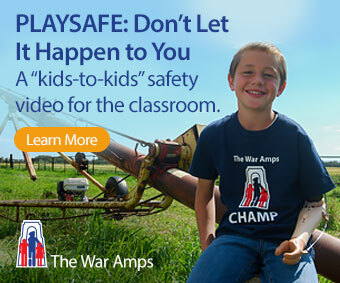 Students may have connections to the story through their own experiences of losing something, lessons they have learned similar to Mayann’s story, and experiences of first time travel.